Description: Join disABILITYsa for the 8th Annual 5K & Parade in the beautiful City of Windcrest on Saturday, April 20th at 8:00am. Dress in your most Festive FiestaEspecial wear and help bring the sights, sounds and excitement of Fiesta Especial to the streets. Costuming is Encouraged! Special Event: 21st ANNUAL FIESTA(r) POOCH PARADE! Description: CELEBRATE FIESTA(r) WITH YOUR POOCH! Dress your dog, wear your fiesta best, or just come in your comfy shoes and celebrate! Therapy Animals of San Antonio hosts the 21st Annual Fiesta(r) Pooch Parade! This much loved event is the main fundraiser for the non-profit organization. Description: When you join March for Babies you stand with thousands of people across the country who share your commitment to building a brighter future for us all. March with us to lead the fight for the health of all moms and babies. Because when a society supports every family, we all win. When we come together,even the toughest problems can be solved. Tickets: There is no registration fee and no minimum fundraising, but every dollar makes a difference! 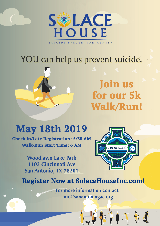 Description: Starting in the dark & early hours of the morning and crossing the finish line just as dawn is breaking, the Solace Sunrise Walk is an annual 5k walk/run that raises funds and awareness for suicide and self-harm prevention.